Yay for getting your camera back! That dark really is a great color, especially combined with the texture of the top. Your friend did a spectacular job with that fringe necklace! 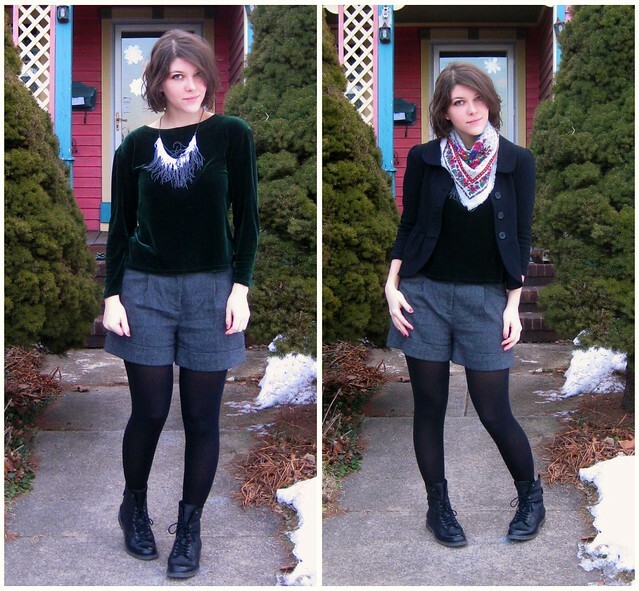 Loving the layers of this outfit and I like how your pics gradually progress each layer. awesome necklace! looks cool in the second picture! and i really like your blazer too! Sigh... those tweed shorts are just perfection on you. I love your hair, too-- it looks like you might have a personal stylist off to the side of the picture! dark green is a gorgeous winter color. i need more of it! i love your hair btw! Those shorts fit you so well, now I want a pair! the top is gorgeous! I adore velvet and in that lovely emerald green shade it looks even prettier! You look really great in this outfit! Your blazer and shorts are awesome! I am glad that you got the camera back, I know what it feels like to be without it. Fabulous outfit. 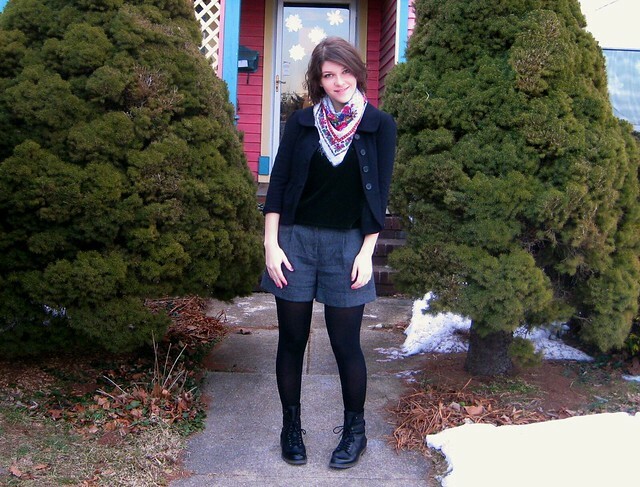 And while I think only cute young women can get away with the shorts/tights look, you certainly qualify. The style is very appealing on you. just to let you know I read your last post, I Just had nothing worthy to add. oh my gosh, i really do wish i had a magical 90's transporting cupboard! Lovely blog and I love the header. This look is so stylish! I love every part of it. I love this, it´s funky and a bit exotic... and your hair looks amazing. Yay for the return of the camera too! Thanks for commenting on my blog! Glad you found me! I just finished reading and commenting on your last post. :| But I'll leave the negativity there! You look great in this outfit...the dark green looks so amazing on you, and I love your scarf! I remember seeing a similar one somewhere and it about killed me not to buy it, but it was just too expensive. And to think you thrifted this little beauty! Oooo I love that necklace! And your new boots look GREAT! Cute outfit!! Such a gorgeous necklace! I love it with the green top. I just read your previous post. What the? You would think in NYC, where there are a zillion witnesses, you could get one person to stick up for you, but it's just like the incident where the girl was killed outside her apt and no one called the police because they thought someone else would. Fucked up. No one wants to get involved, especially when it comes to race, and especially when unchecked violence is present...I'm sorry that happened to you. 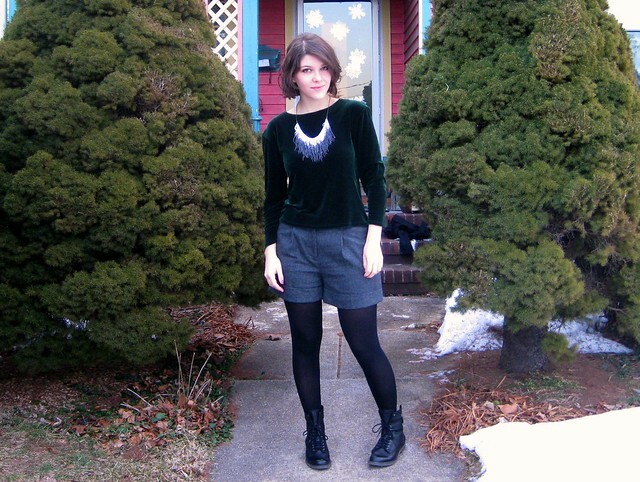 the velour top is gorgeous love the dark shade of green. your boots add further edge to it. you have such a unique way of putting things together! !